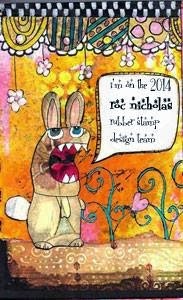 The Roc Nicholas Rubber Stamp Design Team is featuring a "Dog Blog Hop," using Roc's DOG rubber stamp. Hop around, and you'll find a few giveaways, including the magnet below. To enter my giveaway, simply leave a comment on this post. And please, please, please make sure I have a way to contact you if you win, so that I can get your mailing address! A winner for my magnet will be randomly selected on Oct 15. Be sure to check back! To continue the hop, visit Roc's blog. Aw Cathy, this is adorable! this is so wonderful! makes me smile! I love this, so colorful and cool. Nicely done!!! Love this! That hat just *makes* your magnet! OMG!! How fun is this!! A magnet?!! Just darling!! 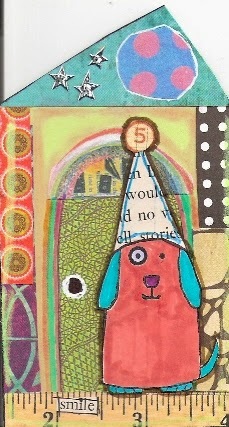 I love Dog and am awaiting him in my order from Stampotique!! OH--just have to say, my Dad lives 70 miles east of you in Fall River Mills, CA :) I was down there earlier this year spending time with my Mom & Dad (before my Mom passed away) and got to take a jaunt into Redding for a day! XOXO-Shari T.
Love your magnet, Cathy ! What a great idea ! Wow, i like to win this lovely magnet, with this cute dog the house! This is such a cute composition! I have this stamp, so I'm so happy to get great ideas and inspiration from the design team! Dog must be so happy to live in this fabulous house!!! what a lovely dog, great card! What a delightful magnet! Love this stamp! and of course your work! Thank you for sharing on this fun hop!